Polhemus technology powers a vast array of virtual reality simulators, so when OmniMedia was faced with the challenge of creating an interactive virtual reality exhibit, the solution was the Polhemus PATRIOT. Challenge: OmniMedia was charged with designing an interactive virtual reality exhibit using a spray paint gun to engage attendees for an automotive trade show. The George P. Johnson Company of Auburn Hills, Michigan, contracted with OmniMedia to work on this project. Polhemus sensor shown in image embedded in the spray paint applicator. Solution: Howard White, President of OmniMedia, looked for a 3D motion tracking device that could be used with a commercial spray gun to provide the most realistic virtual experience. Initially, a primary concern for White was finding a tracking device that had the robustness needed for the application. Given that the show was a large, well-attended event, he knew the device would get frequent use, and thousands of people would be handling it on the trade show floor. White needed tracking technology that provided reliable, repeatable results; he also needed it to work seamlessly with multiple units within the show floor space. The tracking device also had to measure position and orientation, given the nature of the application with the spray paint applicator. After exploring options, White decided on the Polhemus PATRIOT™ motion tracking product for his spray paint exhibit. Because Polhemus technology is electromagnetic-based, line-of-sight is not necessary. This makes Polhemus technology the top choice when an application calls for embedding sensors, as done in the spray painting exhibit. With the sensors embedded into the spray paint applicator, White was able to achieve the most realistic virtual reality environment to illustrate the spray paint application. 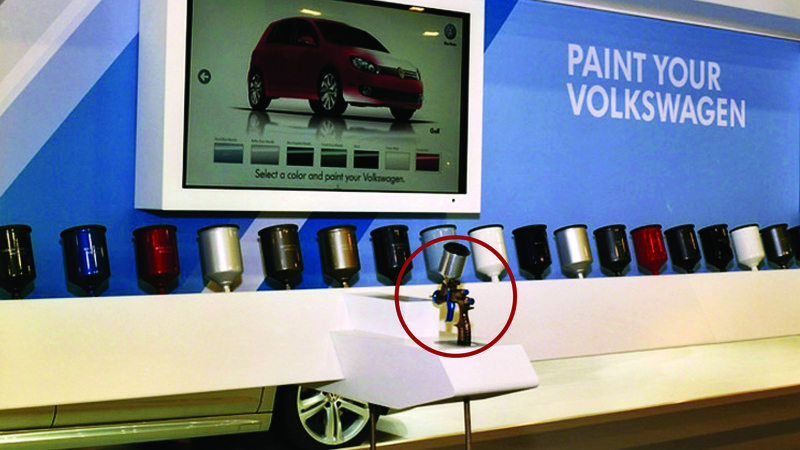 Booth visitors pulled the spray gun trigger to start each unique experience; they selected a car, chose a color, and began spraying. They transformed their virtual car from blank white to an accurate, current color of their selected VW model. By using Polhemus magnetic sensors with high accuracy and low latency, a very realistic experience was successfully created. To enhance the total virtual experience and add realism, sensory inputs wereadded, such as switches and speakers. Polhemus proprietary technology measures both position and orientation, enabling the sensor to track where a person or object is at any time in 3D space. Multiple PATRIOT systems were used concurrently in the same space without cross-talk interference, due to multi-channel operating capability. Because the nature of spray painting requires the user to twist and turn the spray gun in various positions, true 6DOF technology is the only way to achieve this. For this reason, spray painting is a great way to easily illustrate what 6DOF technology actually means and what it does. 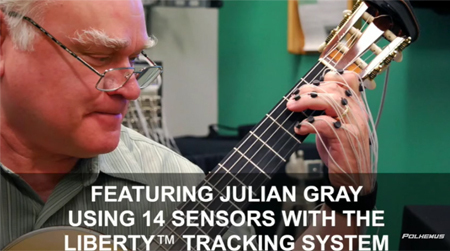 Unlike camera tracking options, Polhemus sensors do not need a field of view in order to track motion; this is why they can be embedded into a custom form factor. OmniMedia engages audiences through innovative and interactive multimedia. From iPad apps to motion activated exhibits and arcade-style games, they create inspiring content and deliver world-class installations. They take the client’s vision and create attention-getting, robust designs that last. (Images courtesy of OmniMedia Group).